List building is great Twitter tool because you don’t have to actually follow someone to keep an eye on what they are tweeting. You can add them to a list so that you are able to put them into a feed to watch in programs such as TweetDeck. You can have your “A-List” companies you want to work with if you are a brand and you can engage with them on a regular basis so that you are able to attract their attention. Other lists could be industry-related influencers or news outlets that let you keep up on the changes in your field. 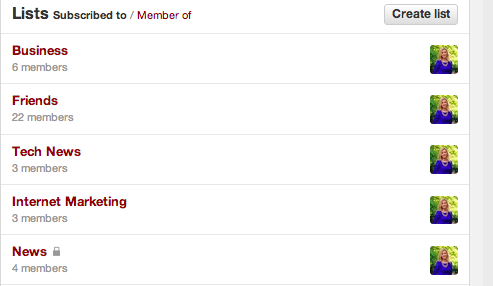 Some of my very basic lists on my personal profile. Helps me to keep organized! I could talk all day on Twitter Chats and how they are the greatest thing out there. They let you engage with people who you share are common interest but would likely never interact with otherwise. How do they work? Basically at a specific hour once a week or once a month everyone follows a specific hashtag for that time and tweets answers to structured questions, asks questions, or simply just answers other people’s questions. 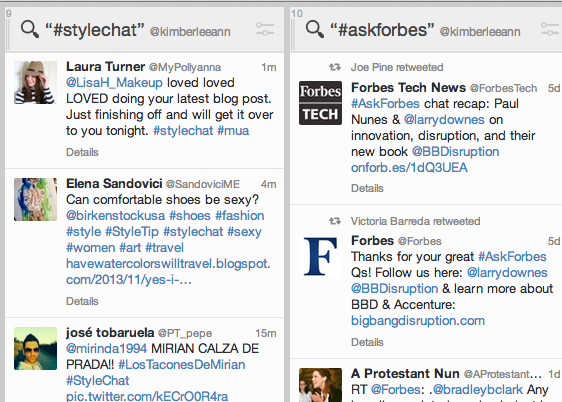 Twitter Chats help you troubleshoot problems or find better ways around doing things. I’ve made plenty of twitter-friends in my industry through them and despite never having actually met theM, they are great to keep in touch with, especially since they are typically working in the same field as me. They have twitter chats for nearly every topic and if by chance you see one they don’t have out there, by all means start it yourself! Sprout Social, if you aren’t on it you should get on it, especially if you are a brand. It gives you detailed reports, lets you do comprehensive brand monitoring, and the coolest feature-it lets you search conversations, twitter bios, or random tweets by location. The ability to search by location is very helpful and slightly creepy but it can do wonders for a brand looking to localize their messaging. Example of some Sprout Social Reporting Metrics.